Are you sick of that mohawk you thought looked good when you created your first character? Has that drab brown hair color been boring you for too long? Perhaps you want something a bit more personal to show off at the west bank of Britain..If you have any of these dilemmas then chances are you need a new hair style, color or a whole new beard! This guide will show you how.Your first port of call should be an alchemist shop, there you can find nearly everything you need for whole new look. In particular you will be looking for this NPC.The hairstylist NPC can provide you with everything you need… For a price. You can always recognize them by the neon hair and habit of wandering for miles away from the actual Alchemist shop.Once found you can fire up your “Vendor buy” macro of choice, depending on gender you will be given different choices. hair menu and the beard coloring stays the same as it was before. What you should be aware of though, is when you use this dye the beard and hair will be changes to the chosen color. If you only want one dyed, then read on. 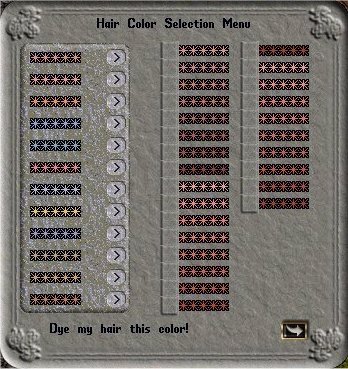 Once picked, this will present you with the same menu as the normal hair dye but will only dye the corresponding hair. 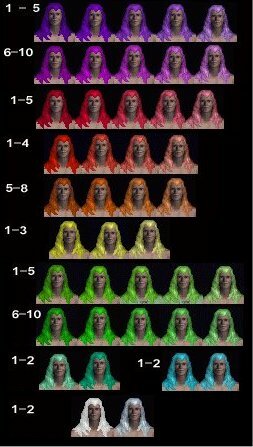 (Hair color examples courtesy of Lord damage)Remember though, if you wish for just the hair or beard to be dyed then you must pick from the Bright Hair/Beard only menu. 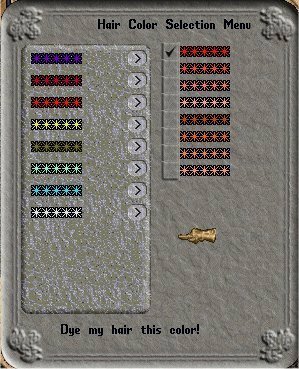 This is not the only way hair can be changed however, all alchemists sell bottles of hair dye which act like the regular 50gp dye, these can also be found occasionally as loot on ratmen and orcs. The bottles however dye the whole hair and beard. So in conclusion, no matter if you are trying to keep up with the latest Britannia fashion or simply looking for a change of hair and a fresh start. 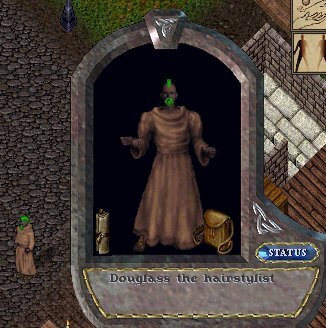 The Hair Stylist NPC will be there for you… (assuming you are not a murderer of course).